As an urban winery, the biggest question that we get is an often incredulous, “where do your grapes come from? !” After calmly explaining that no, we don’t have massive secret rooftop vineyards, we discuss how the beauty of being an urban winery is that we have the freedom to select the best grape varieties from the best regions of the country. Our winemaker Conor McCormack is very selective about the fruit that goes into each bottle of Brooklyn Winery wine. He has established relationships with vineyard owners and growers across the country, selecting individuals and vineyards to work with who share the Brooklyn Winery vision and philosophy that good relationships and good quality go hand in hand. It has always been our goal to showcase the many wine growing regions in the United States, presenting the best quality fruit from each region. While our grapes are grown in vineyards across the country, we make wine at our winery in Brooklyn, New York. 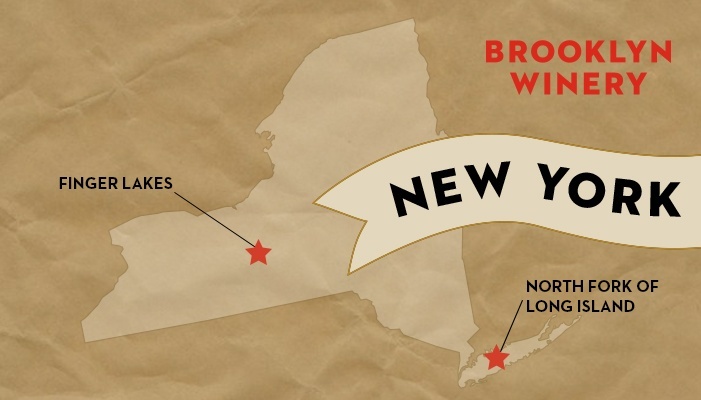 As a Brooklyn-based winery, it’s important to us to work with the best of what New York state has to offer. The state is one of the most booming in the nation for winemaking, with countless vineyards from the Finger Lakes to the North Fork of Long Island producing great wine. Our North Fork wines include (naturally) our North Fork Blend, Reserve Merlot, Reserve Cabernet Sauvignon, and our forthcoming North Fork Cabernet Franc. The North Fork is known for its maritime climate, making its vineyards perfect for red wines that are intense and sophisticated while showcasing true varietal characteristics. This region is historically known for agriculture (most notably potatoes) while its southern counterpart, the South Fork (better known as the Hamptons) is the playground for well-heeled folks from the city. In the Finger Lakes region, we select most of our grapes from vineyards around Seneca Lake, the largest and deepest of the 11 lakes that make up the region. The lakes were formed by glacial carving in the shape of a hand, hence the name. We work with a number of grape varieties from the Finger Lakes, including Chardonnay, Riesling, Gewürztraminer, and Cabernet Franc, which make a variety of our wines, including our trio of chardonnays (Unoaked Chardonnay, Barrel Fermented Chardonnay, Skin Fermented Chardonnay), our sparkling Blanc de Blancs, as well as our trio of rieslings (Dry Riesling, Barrel Fermented Riesling, Skin Fermented), and Gewürztraminer. 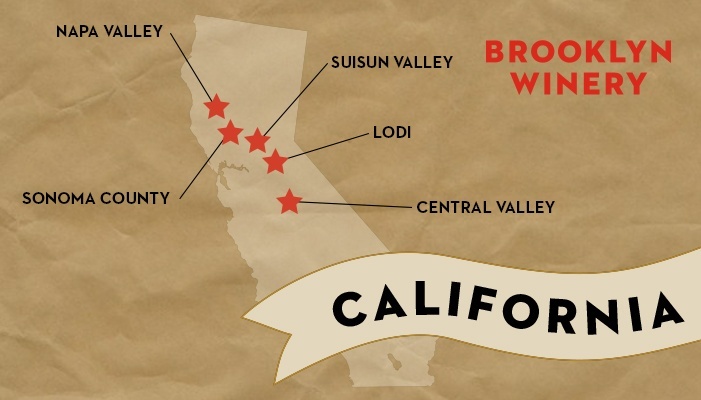 California has become the most well known, and well regarded winemaking state in the United States. Boasting a wide range of climatic conditions and soil types, the state produces an impressive diversity of styles with consistent high quality. Grapes grow extremely well in California’s Mediterranean climate, so we source from a number of regions within the state, selecting each region based on what grows best in that climate. In Sonoma Valley and Napa Valley, Cabernet Sauvignon is king, while Lodi boasts incredible Zinfandel and Petite Sirah. The Suisun Valley is perfectly suited for Malbec as well as Cabernet Sauvignon, while the hotter and drier climate of Madera in the Central Valley is a perfect site for Grenache. Pinot Noir requires a softer touch, so we source from areas that are more affected by the cooling influence of the ocean and bay, notably the Carneros region in Sonoma. The Columbia Gorge region is a unique growing region that includes both Washington and Oregon, and we have sourced grapes from vineyards on both sides of the river that separates the two. The region is known for a wide range of climate and geography in a relatively small area. We find the Pinot Noir and Grenache to be superb from this region. 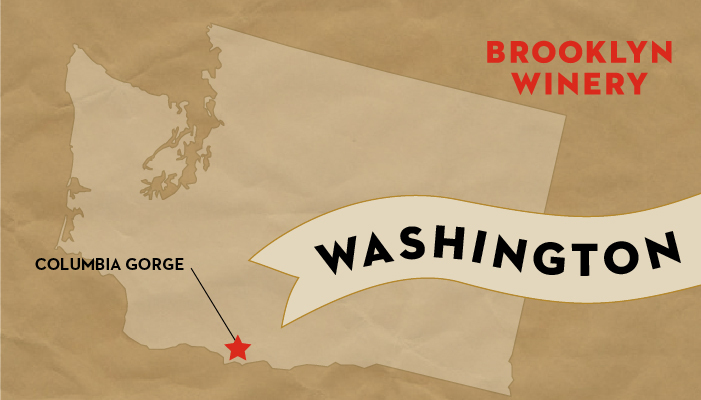 We love the fact that Brooklyn Winery gets the opportunity to boast bi-coastal wines while retaining a connection to the borough that we call home! We like to think that our wines showcase a taste of their diverse vineyards, while boasting personalities that are true to Brooklyn. Tasting a selection of Brooklyn Winery wines side by side shows just how successful a winery can be in urban setting; the fact that we can present guests with an earthy Pinot Noir from Los Carneros alongside a creamy Finger Lakes Barrel Fermented Chardonnay, next to a complex and floral Gewürztraminer shows how diverse our winemaking model allows us to be. 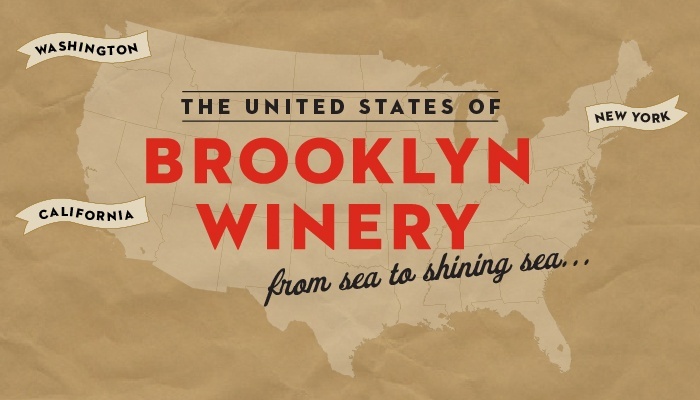 Visit our wine bar to truly visit the United States of Brooklyn Winery—cheers!